Built in the early 3rd century AD for chariot racing, 265 meters long and 50 meters wide. However, it is uncertain as to whether the track was ready for use. It could accommodate up to 17,000 spectators. By the late 4th century the northern part of the hippodrome had been transformed into an amphitheater for gladiator fights and other sports, while the south part was abandoned and squatted by potters. Between the 6th and 8th centuries it was used as a quarry, with materials taken to repair the city wall. At the same time, artisan dyers reused part of the ruins as workshops. In the 8th century the area became the site of mass graves for the hurried burial of hundreds of victims of a plague. 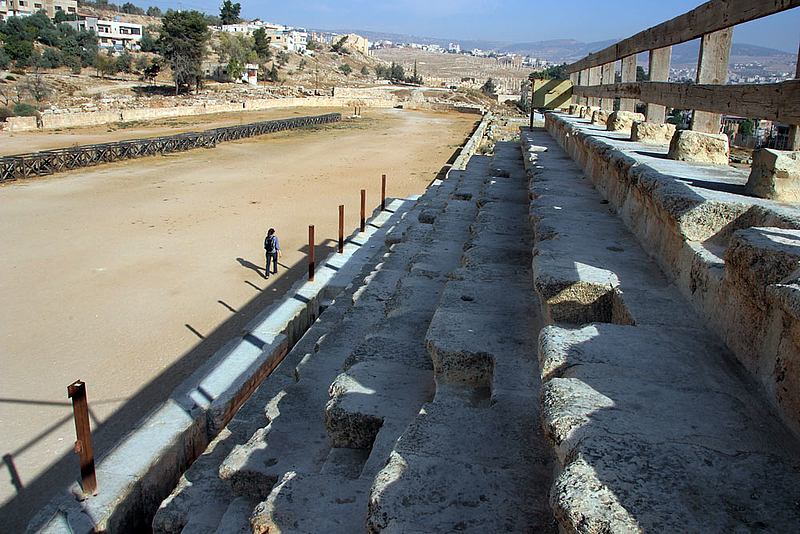 It was the great earthquake of 749 AD that led to the final ruin of the Gerasa hippodrome.